When I first read about the Royalty on Film Blogathon, one film jumped out at me immediately as the topic I should write about. Now, having selected The Chronicles of Narnia: The Lion, the Witch and the Wardrobe as Best Picture at the BAM Awards I have written about it. However, a specific piece on the royalty featured within this film, and the interesting narrative and philosophical devices they are employed in was something I couldn’t pass up. The approach I wanted to take to this topic, because I love this story so, was to revisit the story in three different forms. Aside from a look at the film itself I also wanted to examine the two translations that any novel takes before reaching the big screen (novel to screenplay and screenplay to finished film). This is not a fanboy needing a talking down but rather a comparative analysis. 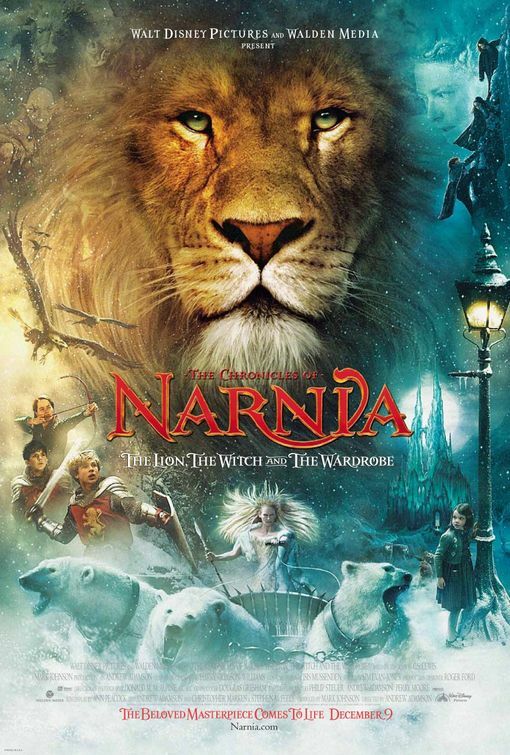 Now, one thing all versions of this particular installment of The Chronicles are focused on, is the power struggle, in external terms, of the chosen monarchs of this land (the Pevensies) and the presumptive tyrant (the White Witch), as well as the one between the White Witch and the Godhead of Narnia (Aslan). Jadis, The White Witch, Chatelain of Cair Paravel, Empress of the Lone Islands, Etc. The bones both to the story and the arc of the White Witch’s persona are not only well established in the book but they are very well adhered to by the screenplay. She: hired Tumnus as a spy, talks to Edmund upon his arrival, harps on the Four Monarchs prophecy, per Lucy and others she has “no right to be queen,” levies constant threats in true authoritarian style, establishes the Secret Police, and seeks to consolidate her power at all costs. The bits of detail in the book are left out of the film add a bit more depth but do not really rob the film of much: on occasion she is called Lilith, after “Adam’s first wife”; she is a Half-Jinn, Half-Giantess; and was the Emperor’s (akin to the Father in the Christian trinity) hangman. One thing this particular filmed version of the story gets absolutely right beyond a shadow of a doubt is the complexity and conflict of Edmund’s chareacter. Oversimplification or piling on of him for his mistakes, as I witnessed in a stage version due to either the bastardized script or the unfaithful direction of the theatre company performing it; is not only a wrongful interpretation but angers me to no end. In the novel we get insights like “Edmund did not like this arrangement at all but dared not disobey” and that “Deep down inside him he really knew that the white witch was bad and cruel.” However, simple visual literacy, as well as the adept personification by Skandar Keynes (which earned him a BAM Award Nomination as Best Actor also) make it quite clear that that doubt and conflict exist within him early on despite his regrettable decisions. In the book it’s stated in black and white he realizes he was lied to and regrets his decision. In the film there is less verbal fat and more visual fodder. What the book includes for all the children are some of the things they either dreamed of before assuming the throne or did once they took it. Edmund dreamed of roads he’d build, a private cinema, giving the beavers lesser legal status, getting revenge, and building railways. It also describes his reign as one where he proves to be “great in council and judgment” and that he is “graver and quieter” than his siblings as he grows, no doubt influenced by these formative experiences upon coming to Narnia. Now, the films spend even less time with the children being actually crowned monarchs than the book does, however, what it does do to compensate for that fact is have loyalists refer to them as “King” or “Queen” or “Your Majesties” and also show where these Sons of Adam and Daughters of Eve act worthy of the thrones they will possess that are their right. Edmund later leads by example, feels pity for Tumnus who he lead to his slaughter, is condemned a traitor and is to be sacrificed for penance and never pleads for his life. His actions in battle are not only part of his redemption but Peter vouches for him. He is also spared of details of the deal the White Witch and Aslan struck. All of this is reflected in the film. He comes a long way, the longest way of all, from the young naïf swayed merely by offers of endless Turkish Delight. Being the deity of this world is frequently referred to as a king as well much in keeping with the Judeo-Christian tradition. He is touted as the rightful king, and in an example of terrestrial kingliness he holds private council with both the White Witch and Edmund (after his rescue). The film wisely follows the books example of having these conversations occur off (screen/page). We are witness merely to the aftermath and it adds a bit of mystery to the proceedings. His willingness to act as a sacrifice and also to want to spare Susan and Lucy the sight of his death but willing to accept their company for the journey is in essence a service a king would provide his subjects. The evidence in the screenplay of the children working into their roles as monarchs is evidenced on the page as well. In one of the earlier drafts when the film version was still referred to as The Hundred Year Winter, Peter is referred to as nodding in “kingly” fashion in a descriptive the precedes the coronation. On page 68 of the script there is use of “majesties” in plural. Over the years they earned their nicknames. In the films Aslan bestows the monikers at coronation. King Peter the Magnificent, Queen Susan the Gentle, Queen Lucy the Valiant. In the film, they had to earn the names along the course of the film such that Aslan could bestow them upon them. Also, having them be assigned territories of Narnia to take special care of to shutdown the nitpicker wondering why one kingdom needs four monarchs. Peter’s nickname is best exemplified by his leadership leading up to and during the battle. Edmund’s name of Just is perhaps the most fitting for it is through being unjust himself to start that he starts to learn firsthand what is right and proper in given situations. Lucy’s valiance is on display from the start as she never wavers in her certitude that the quest to save Tumnus, and thus, Narnia, is right. Susan’s gentility is one you have to dig for. However, its her protectiveness of her siblings, wanting to see them out of harm’s way, her needing to be coaxed into battle, and trying to avoid the conflict if it an be avoided, is where it is seen most readily. In the script, and then in the film, you can see how certain aspects become emphasized. In the film there is more emphasis on the battle, which is dealt with in post-mortem in the book. In the script the White Witch more convincingly sways Edmund here than in the book because the language is simplified and less on the head. Tilda’s interpretation of the White Witch then takes the character to the next level. In the book there is no incidence of Edmund and Tumnus in cells next to one another. This triangulation wherein the White Witch plays Tumnus off Edmund, exagerrating “He traded you in for sweets,” truly allows for additional depth for all character involved: Tumnus suffers further, Edmund experiencing this and plotting his escape aid him redemption, and the Witch is further vilified in cinematic terms. As they prepare for war, Edmund really comes full circle fully committing to a battle he knows he must participate in. The emphasis of screentime spent on their training adds good bonding time for the siblings. Yes, the White Witch through being the antagonist and the reigning monarch, justly or not, takes the led in this film. However, as magnetic and magnificent as Swinton is; he desires and actions are all highly logical and compelling. Having those who are prophesied to inherit a throne slowly travel from a feeling of unworthiness to a desire for and a deserving of that seat is a more compelling journey. Furthermore, the return of a God-king to a land and an ousting of the evil ruler is also compelling. There are few characters in said books that are commoners at the end, but those who bring us into the story, those we travel with are those who will assume the thrones and those we follow. Aslan’s showing favor to the Pevensies lends truth of being anointed by God to this mythic landscape and provides the perfect counterbalance in this story. The Lion, the Witch and the Wardrobe is nearly flawless tale, and a main reason for this is the unique looks at regality it affords us.